It was great being at Princeton Public Library’s Local Author Day! Not only did I get to be one of the featured authors, but I also got to deliver a workshop. I’m a little late with this, but for those workshoppers who wanted a copy of the syllabus/outline I used, here it is. 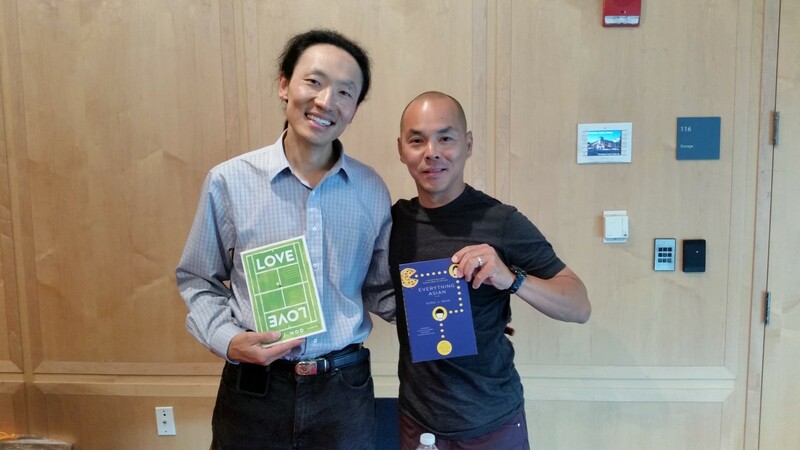 We got some nice coverage of the event via the Princeton Packet, and I made a new Facebook friend, Ed Tseng, another author who happens to be a big tennis fan. Thank you, Princeton Public Library, for inviting me to this fine literary event. There are a lot of billboards in L.A., which probably comes as no surprise to anyone, since it’s a large city with lots of people. What I did not know until I got here is that almost all the billboards are for TV and movies. Here’s a collection. I guess it makes sense, since Hollywood is the town’s biggest export. But it’s just a little strange. Speaking of strange — I took a drive up Sunset Boulevard this afternoon and climbed up Doheny Road, which led to the Doheny Estates. Here are some photos from that little drive. Initially, I found them impressive. But as I kept seeing these monoliths of wealth and power, they creeped me out. These people have such a ridiculous amount of everything…while on the streets, I see beggars, homeless people, mentally unwell people (the usual trifecta of the severely disadvantaged). The L.A. elite live high up, like kings and queens atop their castle, looking down at the city, at their subjects, I suppose. I don’t know. We all know the world isn’t fair, but wow, you really see it here in Los Angeles. It was on this drive up that I experienced one of my quintessential L.A. moments. Because I was following my GPS, and because the road was very snaky, I was going slightly under the 25-MPH speed limit. Right behind me was a guy in sunglasses in an Audi who was absolutely livid, and it was hilarious. Hands flailing, head shaking, gesticulating wildly, he was like Ari Gold of Entourage come alive (“LLOYD!”). When I finally signaled a right, he made a “good riddance” gesture, at which point I gave him a slow, measured wave. I’d caught him off-guard — the whole time, he’d been assuming I was such a tourist dolt to witness his little angry show. That earned me a very firm bird flip from this very L.A. gentleman. My final stop in the evening was Venice Beach, which was quiet and dark and lovely. I could listen to the breaking of waves all night long. I’d read they had a boardwalk, but it’s really more like board asphalt. How can they call it a boardwalk if there are no boards? Maybe I’m just being a stubborn New Jerseyian, but when I think of boardwalks, I think of Seaside Heights, Point Pleasant, Atlantic City. Real boards, made of wood! Let’s just call L.A. an interesting place and leave it at that for now. I had a lot of fun doing something kind of goofy — I visited various San Francisco locations I mentioned in my novel Love Love and posted photos and a snippet of the related text on Instagram. Check it out!